Modex exhibitors began tearing down their booths Thursday afternoon, after 4 days of high energy networking, educational conferences and old fashioned direct marketing. Manufacturers and distributors from all over the country, many of them competitors, rubbed elbows at the Georgia World Conference Center in Atlanta for MODEX 2012, the largest show of its kind in the Southeast. Sponsored by the Material Handling Industry of America, MODEX started on Monday February 6th and wound down Thursday the 9th. This was the first year for the show, and the overall consensus seems to be that it was a resounding success. Exhibitor space was completely sold out, and MHIA CEO George Prest says they are already working on Modex 2014, which will be held in an even larger hall to accommodate more exhibitors. 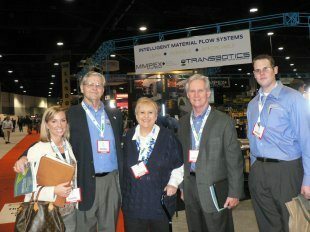 Southeastern modular manufacturer Panel Built, Inc. attended the show, and sent 16 people from various departments. Representatives from Sales, Marketing, Engineering, Materials, Quality, Safety, Shipping, Human Resources, and Production attended over the 4 days. They came back with new insight into the industry, and were excited about some of the solutions they saw. Panel Built also had the opportunity to meet some of their competitors, who were very gracious. With all of the positive industry indicators in the news recently, it appears there will be enough business for everyone. Congratulations to MHIA on a successful event. We look forward to the 2014 show.